When it came to finding the perfect solution for a digital menu board in the Triangle’s largest shopping center, it had to be something that was creative, innovative and dynamic. 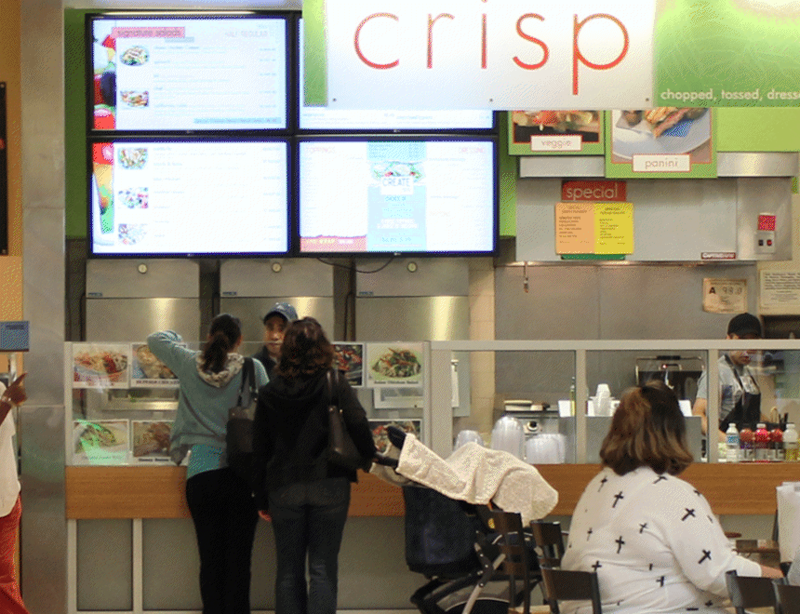 Crisp Salads needed a partner to create a eye-catching and reliable digital menu board solution with flare. They chose Custom Digital Signage to help them fulfill their needs. Providing an engaging display in their fast casual location, while also providing an effective full-service solution was important to them. Custom Digital Signage provided end-to-end management of their digital menu board deployment. We provided a full menu re-design from concept to creation, including animation, specific to the customers ideal presentation. We provided 47″LG commercial-grade large format displays with Chief LSMVU Large FUSION™ pullout mounts to ensure the perfect impact after installation. Custom Digital Signage made implementing and maintaining a one-of-a-kind digital signage solution easy and effective for their location. They entrusted our team of professionals to develop, deploy and manage their intricate digital signage video wall menu, increasing their impact on customers and sales inside their mall food court location.